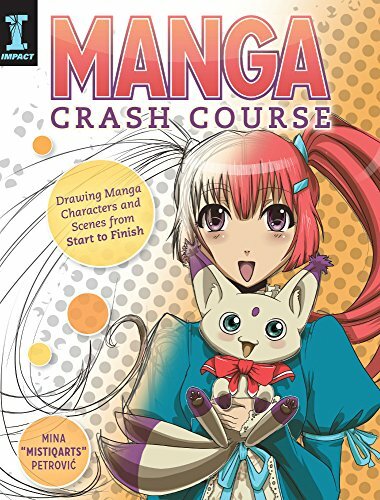 Manga Crash Course is a beginner's guide to drawing manga. The author is Mina Petrović aka Mistiqarts on her popular Youtube channel. Mistiqarts' videos on Youtube teach manga drawing as well. The videos aren't released in any particular order so this book is a more convenient because it adopts a more structured approach to learning. And when you want to learn more about a specific subject, you can then search for the video on her Youtube channel. This book covers the drawing of characters. You'll get to learn how to draw the eyes, head, bodies, hands and clothes. It's all quite basic and the instructions are easy to follow along. The tutorials also cover basic pencil and inking techniques, how to draw a manga page with colours and shading. To come up with ideas on what characters to draw, there's The Idea Game which will help you brainstorm for interesting characters. There are lots of hands-on exercises so it's great book for beginners who want to start drawing immediately.